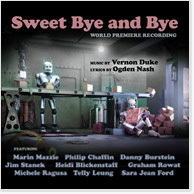 Could SWEET BYE AND BYE be the greatest theatre score no one’s ever heard? It certainly boasts an amazing pedigree: music by Vernon Duke, lyrics by Ogden Nash, a book by S. J. Perelman and Al Hirschfeld. It crashed and burned during its pre-Broadway tryout in 1946 for various reasons -- some conceptual, some creative, some casting-related -- but at the end of the day what’s left is a glorious collection of songs: restlessly inventive, playful and romantic -- perhaps Vernon Duke’s finest theatrical achievement. A futuristic farce sending up big business, telecommunications, robotics, space travel, self-help groups and even the traditions of courtship and matrimony, at heart SWEET BYE AND BYE is a simple love story with some of the most beautiful ballads Broadway had ever heard. The world premiere recording of this Broadway-musical-that-never-was has been lovingly restored from Duke and Nash’s original manuscripts by producer Tommy Krasker and orchestrator Jason Carr. With conductor Eric Stern leading the orchestra, and featuring a cast of Broadway and recording veterans -- including Danny Burstein, Philip Chaffin, Jim Stanek, Heidi Blickenstaff, Graham Rowat, Michele Ragusa, Telly Leung, Sara Jean Ford and, in the starring role originated by Dolores Gray, Marin Mazzie (with guest appearances by Fred Applegate, John Cullum, Georgia Engel, Joel Hatch, Edward Hibbert and Rebecca Luker) -- SWEET BYE AND BYE is perhaps the ultimate jewel in the crown of PS Classics’ forgotten musicals series.